Approximately 1.8 million years ago a variety of East Asian sorghum (Sorghum propinquum), a tropical tall flowering grass, and the ancestor of domesticated African sorghum (Sorghum bicolor), diverged from each other to form separate species. Nobody knows when, but they later hybridized to form a hugely successful hybrid. Thus was born the Johnsongrass (Sorghum halepense) whose hybrid origins also gave it the curious quality of being tetraploid, so having four sets of chromosomes, rather than the usual two. Fast forward to the 1800s in America: shortly after the American Revolutionary War, a governor of South Carolina, John Hugh Means, imports some hemp seeds from a Turkish port in what was then the Ottoman Empire. Fatefully, these seeds were contaminated with those of the Johnsongrass and the vigorously growing weed was soon spotted growing in plantations. Governor Means, seeing the potential of the grass as a promising foraging grass, sent some seeds to his son-in-law Colonel Johnson in Alabama with a letter expressing his thoughts and wishes. With the best intentions, Colonel Johnson planted the weed in his ranch and the rest is history. The weed established itself in agricultural fields and roadsides, rapidly spreading into other states. Sadly, not long later both Colonel Johnson and Governor Means were killed on the battlefield during the American Civil War but their agricultural legacy remains with us in unexpected ways. Johnsongrass is now a noxious weed that has invaded most of the southern US from the Atlantic to the Pacific coast. Moreover, it is evolving to adapt to new environments and is steadily marching north. The grass has already invaded many continents with the help of its human carriers, including South America and Australia. In Argentina researchers have shown that it has evolved natural resistance to one of the most commonly used commercial herbicides, RoundUp, manufactured by Monsanto. Predictions computed through niche modelling have also indicated that Johnsongrass will continue to evolve and adapt to new habitats. Although the plant initially colonized agricultural fields and roadsides there is now evidence to suggest that the colonization is continuing into non-agricultural habitats such as abandoned lots. 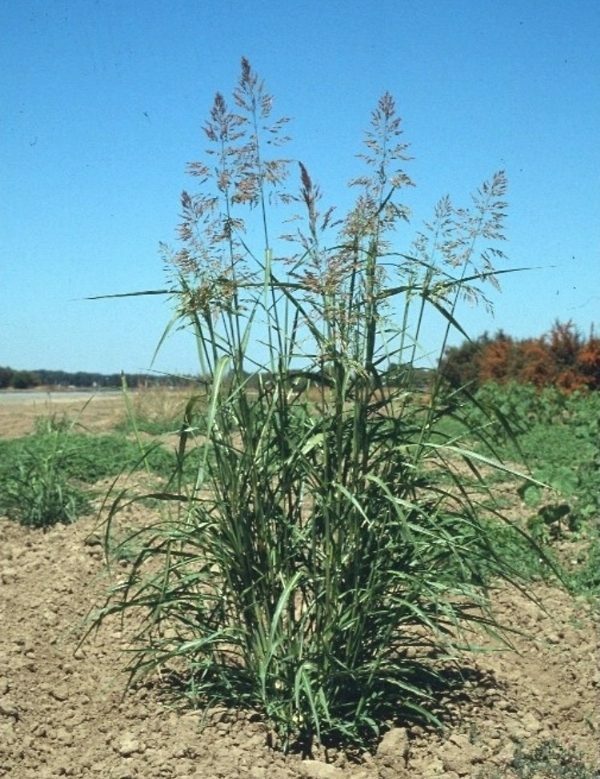 When Colonel Johnson and Governor Means started planting this invasive grass on their ranches they could never envision that they were actually sowing the seeds of a continent-wide diversity panel, a pool of diverse genetic material that would serve as a valuable genetic resource for the improvement of domesticated sorghum. Agricultural plants have lost a great portion of their natural diversity throughout the protracted domestication process of the past millennia. Wild relatives of crops are very valuable to regain natural diversity through breeding programs. Domesticated sorghum can be easily pollinated with Johnsongrass. Using the same pollination technique Mendel used in his peas, crossing the two species can bring many beneficial genes conferring resistance to diseases and pests. Two hundred years after this natural experiment began a research team reconstructed the colonization pathways of Johnsongrass. The invasion of North America by this weed represents another case of “blank slate” colonization, where a species spreads to new habitats in which it never existed before. Blank slate colonization is usually observed in newly formed volcanic islands. A continental scale blank slate colonization is particularly interesting for biologists studying biological invasions. The research team used molecular genetic markers based on samples collected across 12 states covering much of the current range of the plant. The team has published their findings in the open access scientific journal PLoS One. The lead author of the study Dr Uzay Sezen is a researcher at the University of Connecticut’s department of Ecology and Evolutionary Biology with a special interest in gene flow. The study described the patterns of genetic diversity found in Johnsongrass populations across the US and revealed a number of interesting findings. A genetic tree has confirmed the historical account and showed that colonization started in South Carolina and Alabama. Unexpectedly, the genetic tree had another deep branch in Arizona suggesting a previously unreported independent origin for colonization. Colonization of the continent from two ends resulted in a genetic pattern where the centers of origin and regions of maximal diversity do not overlap. Researchers have shown that the highest genetic diversity resided in the region between Georgia and east Texas where waves of colonization from two ends of the continent meet and generate genetically enriched genotypes. Intercontinental railroad building that took place in those times may have contributed to the intermixing. Now the researchers know which Johnsongrass populations are the most genetically rich. They will use these diverse groups as elite stocks to improve domesticated sorghum by classical breeding. Sorghum species form a very interesting family. For instance, domesticated sorghum is a close relative of the highly productive sugarcane, the two species having only diverged from each other about 9 million years ago. All sorghum lineages possess an evolutionarily recent photosynthetic pathway that enables more efficient capture of carbon dioxide from the air, known as C4 carbon fixation. Carbon fixation is the first step in incorporating carbon from carbon dioxide to use in sugars and other biomolecules. Although more elaborate and energy demanding than other methods of photosynthesis, grasses carrying out C4 photosynthesis have special advantages in a warming climate. Also of great importance, Johnsongrass could be a useful genetic resource for developing perennial sorghum. Perennial plants have a permanent root structure that can prevent soil erosion and store carbon. Perennial plants can also utilize fertilizers better and grow rapidly when conditions become favorable. Johnsongrass is a valuable plant species since it shares half of its genome with domesticated sorghum. Domesticated sorghum became the 8th plant to have its genome sequenced and genes annotated to a very high quality. According to Food and Agricultural Organization (FAO) it is the 5th most important cereal based on area planted and production. Domesticated sorghum has an exceptional capacity to survive under drought conditions. Johnsongrass is a hybrid of a wet tropical sorghum and a drought-adapted temperate sorghum. The dual genomes it carries renders it almost invincible against both very wet and dry conditions. Dr Sezen’s study will be foundational for future projects aiming to improve domesticated sorghum by understanding its wild relatives. Previous article Previous post: Do You Crave Sweets After Sleepless Nights?